Find Your Perfect Job with Hypnotherapy! 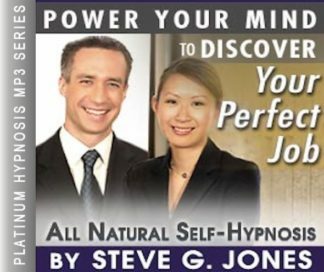 Have an edge and a much better chance at getting the job that you want with this self-hypnosis mp3 by Steve G. Jones! Discover your heart’s desire for your work in life, and finally get on track to feeling fulfilled and satisfied! FIND YOUR PERFECT JOB WITH HYPNOTHERAPY!!! The Find Your Perfect Job Hypnosis MP3 will give you the jump-start you need !!! Steve G. Jones takes you to the next level, puts the wind back in your sails, and helps you discover and achieve the perfect job for you! It’s easier than you think. You’ll see a new you and you’ll feel great about it!!! Steve G. Jones, Ed.D., Clinical Hypnotherapist, charges $1,500 for a custom recording and $25,000 for a one-hour private hypnotherapy session at his office. But you can get all the benefits for this low price. Simply listen to the Find Your Perfect Job Hypnosis MP3 audio every night as you go to bed for three weeks and feel the changes happening in your life. You will feel more empowered, more in touch with your true self, and you will truly know that your goals are within your reach. Steve G. Jones achieves AMAZING and LASTING results!!! Hypnosis is the easiest way to affect change in your life because the positive messages go straight to your subconscious mind effortlessly so you can accomplish your goals and reach for the stars!! All you have to do is listen to the Find Your Perfect Job Hypnosis MP3 session at night as you go to sleep!!! You’ll hear soft music, the gentle sounds of the beach, and the soothing sound of Steve G. Jones’ voice all working together to bring about positive changes in your life easily and naturally. Steve G. Jones has been helping people improve their lives with hypnosis for over 17 years…now it’s time for him to help YOU… don’t wait, do it NOW !!! you’ll be glad you did. See you at the top! When you were a child, what did you dream about doing when you grew up? What is your ideal job? What job would give you the perfect amount of money and happiness? So many people are stuck in jobs that they do not want to do. People often feel that they cannot change jobs because they are vested in their company and they don’t want to have to start over. Finding your perfect job is important. Your perfect job will give you the right balance of money and happiness. Your perfect job will allow you to work the hours you want to work. It will give you the motivation to accomplish your goals and dreams. You may ask yourself what your perfect job is. Think about your strengths and weaknesses. Ask yourself what you truly want from a job, whether it’s money, happiness, fulfillment, or a challenge. I encourage you to find out what your dream job is and then to pursue it. And as you relax deeper, deeper, and more deeply relaxed, I would like you now to imagine yourself sitting in front of several television sets. Perhaps there are five, ten, or twenty, or a hundred, as many as you choose to see. And on each of these television sets you see yourself performing a different job. The truth is there are many things you are capable of doing. Yet, there are only a few which will lead to your ultimate satisfaction and allow you to achieve the goals you want to achieve in your life and allow you to fulfill your destiny and do what you are meant to do. So as you watch yourself perform these various jobs on these television sets, if you see yourself performing a job which doesn’t measure up to your criteria, your criteria for what is good for you, for what makes you feel good about yourself, turn that television off now. And as we go through this exercise you will notice television sets being turned off every now and then because as you zero in, as you focus on your perfect job you find that the other jobs just don’t measure up. Certainly you can perform them, but for whatever reason they are not what you are meant to do. I want you now to turn off all the television sets which show you doing something which you really don’t like doing. Any of the television sets displaying you performing a job that you really don’t like doing, turn those television sets off right now, turn them off. Now, turn off any television sets which show you doing something which someone else wants you to do, which you only partially want to do, turn those television sets off. And occasionally in this exercise certain television sets will come back on showing you doing something different. So now I invite you to turn on certain television sets which will show you doing a job which you would love to do but you formerly thought that you couldn’t. See those television sets coming on now, that’s right. It can be any job at all. The possibilities are endless, any job, any job. This is just happening in your mind so feel free to imagine yourself doing any job at all. Any job that you want to do but previously you thought that you couldn’t. Now, I want you to turn off any television sets that show you doing a job that you do not think will lead you to the level of financial satisfaction which you desire. Turn those television sets off now. I want you to turn off any television sets which show you doing a job which you really know that you shouldn’t be doing, that’s right. A job that your conscience tells you not to do. Tune in now to your conscience. Your conscience is what tells you right from wrong. We all have one. Certainly, there is no such thing as an absolute right and wrong, but you have an internal compass that tells you your truth, what’s right and what is wrong for you. So now, any television sets which show you doing a job that is wrong for you, turn them off. And perhaps now you are thinking of other jobs you can do. As these ideas come to you, allow those television sets to turn back on, showing you doing that new job that you just thought of, that’s right. Now, of the remaining television sets that are on, I want you to freeze everything right now. No matter how many or how few television sets are on, just freeze them. Give them all labels. Give all of those jobs labels now. Take your time, label them, simple labels, big labels that you can read easily or perhaps you can hear them, hear those labels if you more of an auditory person, a person who relates more to sound. So now you can either see the labels on those various jobs or hear the labels. Either way, finish up now and label the rest of the jobs. Now, I don’t know how many jobs you have in front of you, but I want you to narrow it down to no more than ten. So if you have more than ten, I want you to just tap into your gut reaction and get rid of all of them except ten. Which ever ones you want to eliminate first, eliminate so that you are left with only ten jobs, do this now. Don’t think, just do it. Now, again I don’t’ know how many jobs you have in front of you, but I want you to narrow it down to no more than five jobs, five jobs maximum. So if the number is not already five or fewer, go ahead and eliminate any that are beyond five. Just the ones that you feel you should eliminate, do it now, don’t think just do. good. And now you have a maximum of five jobs in front of you. Now the goal of this exercise is to find your perfect job. One job that is perfect for you, one, of the remaining. Now again, I don’t know how many you see in front of you, but of the remaining jobs, I want you to eliminate all but two. So if you have more than two, eliminate all but two. Do it now, don’t even think, just do, good. Now you just have two. Now, one of them is going to appeal to you more than the other. Choose that one now, the one that appeals to you more, just do it, don’t think, just do. And as you do it the other one disappears and all the other television sets go away so that you just see yourself doing that one job. That television set becomes louder and brighter, begins to show you in various scenes doing that job. I want you to embrace this job now and realize that you are going to move toward this job in your life. This is the perfect job for you and you will do everything you can to make this job happen. Now, see yourself in the future, at the time when you have this job. Certainly, it could be a professional job which could take you awhile to obtain, that’s fine. See yourself in the future doing that job and as you look back now at the present you see all the simple, easy, logical steps which had to happen for you to get that job. See how easy they are as you look at them from the future. See yourself in that job, perhaps wearing that uniform, wearing whatever clothes you wear for that job. Perhaps you wear your everyday clothes for that job. Whatever you wear or don’t wear for that job, see yourself in that job. How does it feel to be in that job? Your perfect job feels wonderful. What are the sights? What are the sounds? What do you smell? Be a part of it now. This is your future. And as you move back now to the present you realize that you will get this perfect job if you don’t already have it. You will take the steps necessary to get this perfect job and fulfill your destiny. So relax. Be very happy with yourself because you have done what so few people do. You have made a powerful decision for your future. So now go get that job if you don’t already have it. Go take the steps necessary to get that job and if you already have it, think of ways that you can improve it. Make it more fun and exciting, more multi-dimensional. Think of new skills you can learn in this job. Congratulations, relax because everything is going to be just fine. One of the first steps in finding your perfect job is figuring out what makes you truly happy and this hypnosis recording will help YOU figure it out! Whether you have an idea of what industry you want to work in or if you have no idea, the Find your Perfect Job hypnosis program will help you not only find the job, but land the job! This powerful program will help you be open to the many options that are available to you. You will realize that you are smart, talented, and have a lot to offer. The Find Your Perfect Job Hypnosis MP3 will open up your creative mind and help you explore the many options that are available to you. As you listen to this hypnosis session every night for three weeks, you will be patient and open-minded in order to allow your dream job to manifest. Along with listening to this self-hypnosis recording every night before going to bed, you will want to be aware of the opportunities around you. This powerful hypnotherapy program will show you the way and will encourage you to be proactive in your quest to find your perfect job. Opportunities are all around you and this hypnosis recording will help you become more aware of your surroundings. Finding your perfect job is all about knowing what you want and going after it. This recording will help you with the process of finding your perfect job. You will find your dream job. And the Find Your Perfect Job Hypnosis MP3 will help you get there!